EverLast™ Basement Windows eliminate a prime source of air leakage in the basement. In a document published by the US Department of Energy, it is reported that energy bills can be saved by 30-40% simply by sealing all windows in cold climates. If you look at those facts carefully, they make a lot of sense. The basement is surrounded by thick walls on all sides of the home—except where the basement windows are. As far as insulation is concerned, the windows are the weakest link. If you finish your home and neglect to make sure your basement windows are sealed the best they can be, you're overlooking an important point! 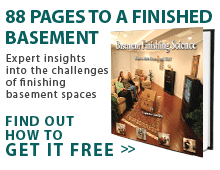 Total Basement Finishing offers basement window insulation services to promote comfort and energy efficiency in your home. To schedule a free estimate and get started on a more comfortable climate in your finished basement, contact your local TBF dealer! How can windows save more energy? Single-paned basement windows with steel frames perform poorly when it comes to basement insulation. Even brand new, they only have an R-1 insulation rating. However, these rust-prone windows will deteriorate in about five years, and as they do, their R-rating will, too. Wooden windows decompose at a similar rate and can attract insects as they do. However, windows with double panes and vinyl construction are better. With an R-rating of 2, they are twice as good as steel or wood at resisting the conduction of heat from the basement. Because of the sliding operation, they are less likely to leak cold winter air (or humid summer air) into the basement. Installing Low-E glass in the basement windows will also make a very significant difference in their ability to insulate. In the example of the double-paned basement windows with vinyl siding and an R value of 2, using low-E glass will raise the insulative R-rating to almost 3! Low-E glass has been proven to allow the heating rays of the sun into the home in the winter while reflecting them in the summer, giving the basement extra heat just when you need it. 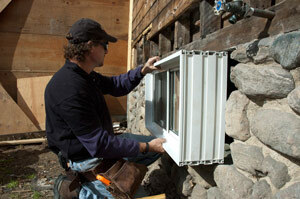 Another way to add insulation to a basement window well is to install a reliable basement window well enclosure. Removing ugly, rusted steel basement window wells and adding a plastic enclosure that can reflect beautiful sunlight back into the finished basement while keeping cold, unforgiving winter winds away. Window well enclosures create an air buffer between the windows and the outside environment. Total Basement Finishing installs EverLast™ Basement Windows as part of their basement finishing system because they are the best choice for remodeled basements. These crystal clear insulated windows include vinyl framing and energy-efficient Low-E glass. They never need paint and will never corrode, allowing them to send beautiful light into your basement for years to come! Contact Total Basement Finishing today to setup a basement finishing consultation and Free Estimate for basement window insulation.